[PDF] Topological Methods in Data Analysis and Visualization II: Theory, Algorithms, and Applications (Mathematics and Visualization) | Free eBooks Download - EBOOKEE! Description: When scientists analyze datasets in a search for underlying phenomena, patterns or causal factors, their first step is often an automatic or semi-automatic search for structures in the data. Of these feature-extraction methods, topological ones stand out due to their solid mathematical foundation. Topologically defined structuresâ€”as found in scalar, vector and tensor fieldsâ€”have proven their merit in a wide range of scientific domains, and scientists have found them to be revealing in subjects such as physics, engineering, and medicine. 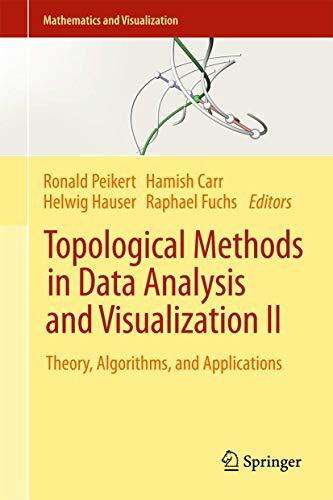 Full of state-of-the-art research and contemporary hot topics in the subject, this volume is a selection of peer-reviewed papers originally presented at the fourth Workshop on Topology-Based Methods in Data Analysis and Visualization, TopoInVis 2011, held in Zurich, Switzerland. The workshop brought together many of the leading lights in the field for a mixture of formal presentations and discussion. One topic currently generating a great deal of interest, and explored in several chapters here, is the search for topological structures in time-dependent flows, and their relationship with Lagrangian coherent structures. Contributors also focus on discrete topologies of scalar and vector fields, and on persistence-based simplification, among other issues of note. The new research results included in this volume relate to all three key areas in data analysisâ€”theory, algorithms and applications. No comments for "[PDF] Topological Methods in Data Analysis and Visualization II: Theory, Algorithms, and Applications (Mathematics and Visualization)".